It's a shame. That's the only word: a poor dirty and minimalist room for...200 e!!!! The walls are dirty, and so is the bathroom. FORGET!!!! When we arrived we discovered that the hotel was having renovations to its rooms so it was a bit noisy, but having said that we could not fault it as the staff bent over backwards to help and we had a very pleasant stay and would recommend it. Good place to make a stop during journey. Clean room and bath room, comfortable bed. Breakfast ok.
Great for a stop over, bed really comfy, nice to have tea/ coffee making facilities. Great shower. Easy to find. Good to be able to park right opposite room. Felt safe area. This hotel is in a quiet location, far from a city center. But if you're traveling by car, there should be no problem. They have a big parking space just in front of a hotel and we actually parked our car just in front of our room. Staff were really nice, they were helpful, even though speaking English was challenging. The room was big, also a bathroom. The bed was comfortable and everything was really clean and nice. Wifi was working perfectly. Breakfast was also very delicious. The convenience, especially the proximity to the fields which our dog enjoyed! The staff were very friendly. Room comfortable. Food good but on the expensive side. 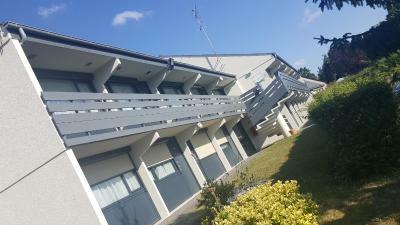 Located on the outskirts of Rennes, 3.1 mi from the town center and 6.2 mi from the airport, the Comfort Hotel Rennes Chantepie offers easy access to the region's motorways. All rooms have a flatscreen TV with satellite channels, free WiFi, tea and coffee making facilities, a desk and a private bathroom. The hotel also has a conference room equipped with a projector. A buffet breakfast is served daily. The hotel's restaurant is open from 19:00 to 22:00 Monday to Friday. 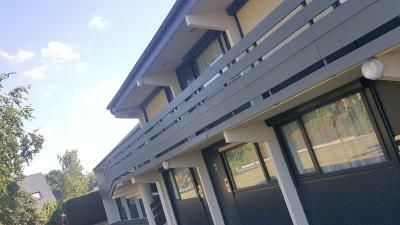 When would you like to stay at Hotel The Originals Rennes Sud? This double room features a kettle, a TV with satellite channels and WiFi. House Rules Hotel The Originals Rennes Sud takes special requests – add in the next step! ANCV Chèques-Vacances Hotel The Originals Rennes Sud accepts these cards and reserves the right to temporarily hold an amount prior to arrival. Hotel The Originals Rennes Sud accepts these cards and reserves the right to temporarily hold an amount prior to arrival. Reception is open from 06:30 to 23:00 Monday to Friday and 07:00 to 23:00 at the weekend. Guests arriving after 23:00 must notify the hotel in advance of their arrival. At first it looked clean, but unfortunately it wasn't. We spotted cockroaches, disgusting. The hotel lays next to a road, which makes a lot of noice. Wouldn't recommend this place. I would recommend this hotel but when I arrived at home and checked my booking page, I noticed that I have status "not arrived" by reservation for this hotel. This made me really angry because we had a reservation and we stayed there and we also paid for staying there (with cash). A shower is more convenient instead of a shower over a both. Overpriced small snack required in resturant to be able to buy a small beer. No food - No alcohol - :( Lack of temperature conftrol in the room unless you want to share the room with a few hundred mosquitos .